Some Belmont Shore residents were awoken early Friday by protestors against a planned march by residents who sought to reclaim their neighborhood from crime by marching down the Second Street strip in a show of force. The stillness of the morning was punctuated by the sound of bullhorns and protestors chanting in favor of human rights, as residents mulled around quietly with coffees in hand on the opposite side of the intersection of Second Street and Bay Shore Avenue. The march’s organizer, Barry Vince, sought again to clarify his message. “This is not a march against the homeless,” Vince told reporters. Vince organized the march as a way for his neighbors to identify and report potential criminals to the Long Beach Police Department, as he said crime in the area had gotten out of hand. 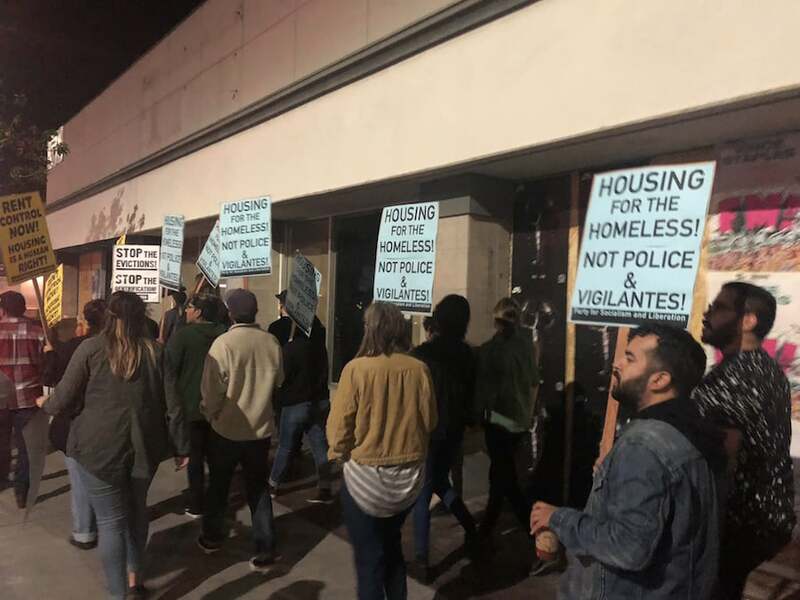 The opposition group saw his plans as an attempt to drive out the homeless from an affluent part of East Long Beach by a vigilante group not qualified to take on crime or homelessness. The tone of the march quickly became political with slogans surrounding Proposition 10—an attempt to repeal a state law that outlines what types of homes can be subject to rent control—being chanted by the protesting group while members of the march remarked privately to one another whether they were paid protestors. The march made its way west on Second Street, with members of the march on the south side of the street and protestors on the north. One woman in the group of about 60 residents remarked that she couldn’t believe the protestors got up to do this. As the march made its way past closed businesses, joggers and people filtering into and out of coffee shops, several motorists drove by and shouted expletives at the group protesting the march. But the verbal assaults did not put a dent in the resolve of the group as protestors continued to chant about housing being a human right. Those sentiments are not something that the rest of Long Beach endorses, Justine L. said. One resident with a background in homeless services who attended the march to observe, but wished to remain anonymous, said that while Belmont Shore may not be more impacted homelessness than the rest of the city, it’s a subjective issue that becomes more real when you actually see it. Protestors opposing the march carried signs and shouted through megaphones as they followed the neighborhood group. Photo by Jason Ruiz. The march lasted just over an hour as the two groups made their way around Second Street and circled back to its starting point using the beach pedestrian path. Vince said that he felt his initial message had been misunderstood while recognizing that some of the comments on social media may have fueled the fire of the protestors. Vince was referring to a resident along the path taken by the march who aggressively confronted the protestors using homophobic slurs before being restrained by another woman. The man returned to his house where he pointed a water hose over a fence in an attempt to wet the protestors, who calmly deflected the stream with their signs. While noting that bringing this many people together in the morning to discuss ways that they could be of help to their neighbors was a good thing, Vince admitted that any future attempts to patrol the neighborhood will have to look a lot different.